Home baby military I threw an Army themed baby shower. Back in December Rob and I hosted a baby shower for our best friends here in Georgia. 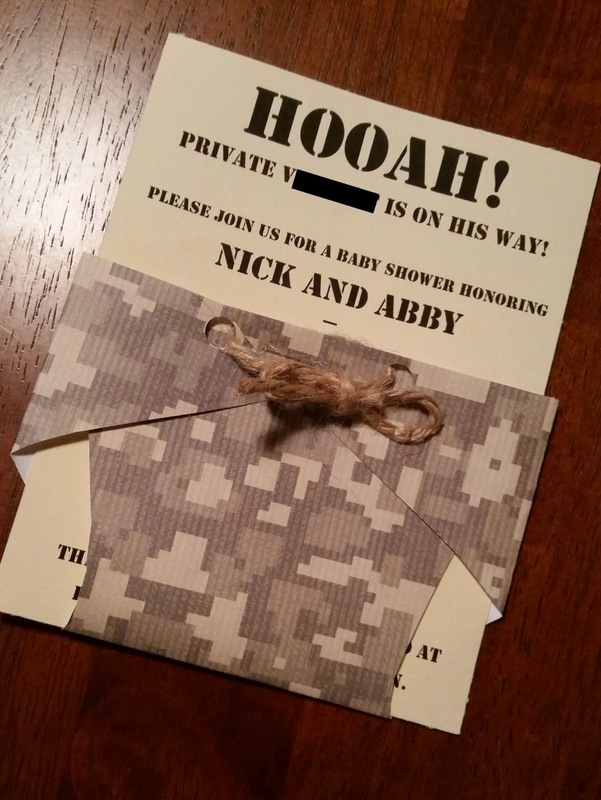 As if my life doesn't consist of enough Army related stuff... the baby shower was Army themed. BUT after seeing what Pinterest suggested.. I was able to pull it off. And I am really proud of the outcome. Invitations ** I made these with ACU colored scrapbook paper and cream colored cardstock. Downloaded a fun Army font, a little cutting, a little folding, a little tying.. and wallah. Welcome table ** We of course had to play the "baby" game. 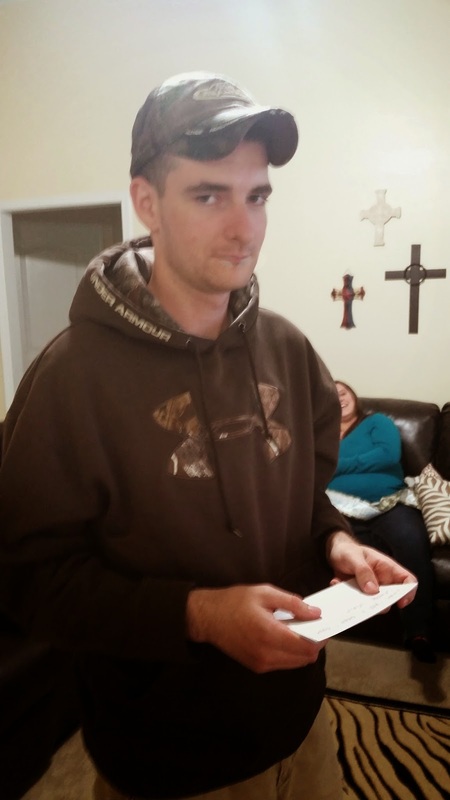 But with an Army twist, dog tags instead of safety pins (dog tags were found at Hobby Lobby). 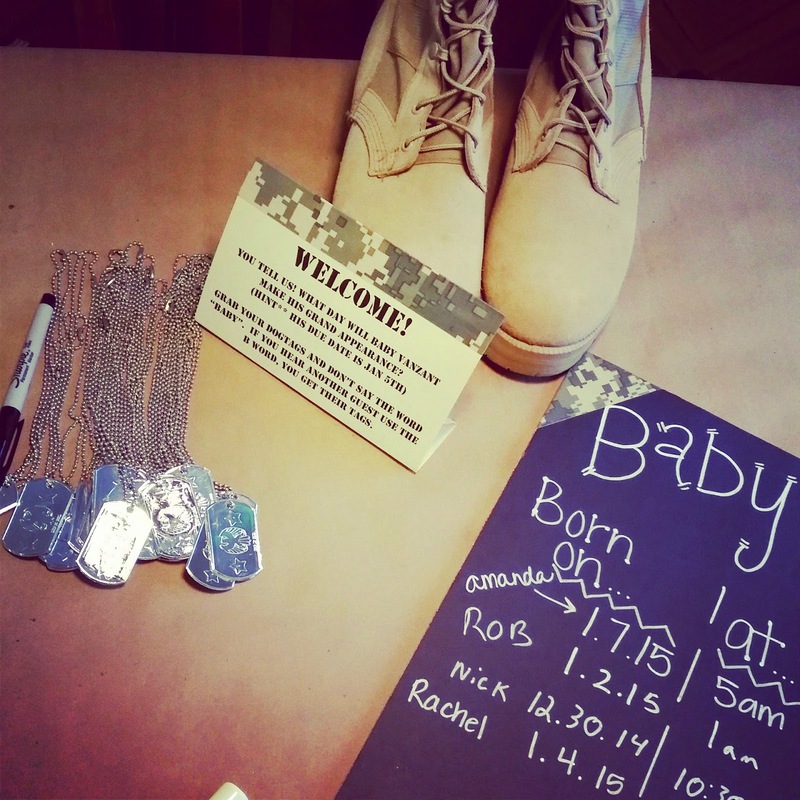 I took a black poster board and some chalk markers to make a special board for everyone to guess what day the baby would actually arrive, what time, how big and how long. The corners were just taped with some ACU duct tape (found at Hobby Lobby). Then I set out some of Rob's gear. Obviously I can't speak for Nick and Abby.. but personally, I had fun! It was a small little gathering.. but perfect timing early in the month. We are so lucky to have these two as friends.. and we have tons of great memories with them. When I think of the possibility of leaving Fort Gordon sometime in the not so distant future, I get sad. Sad to leave these two and the friendship we have with them. So it was awesome to get the opportunity to throw a little party for them! Especially since on Christmas day (nobody guessed that day!) little man made his arrival.. I can't get enough y'all. 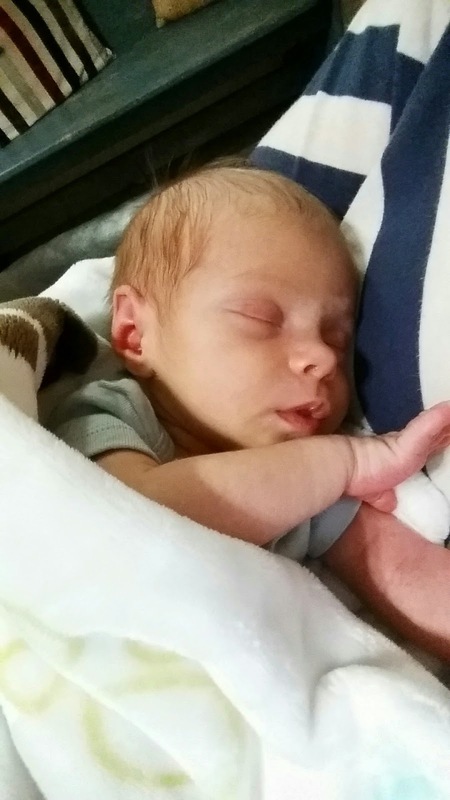 Sweet baby cuddles, this last weekend. 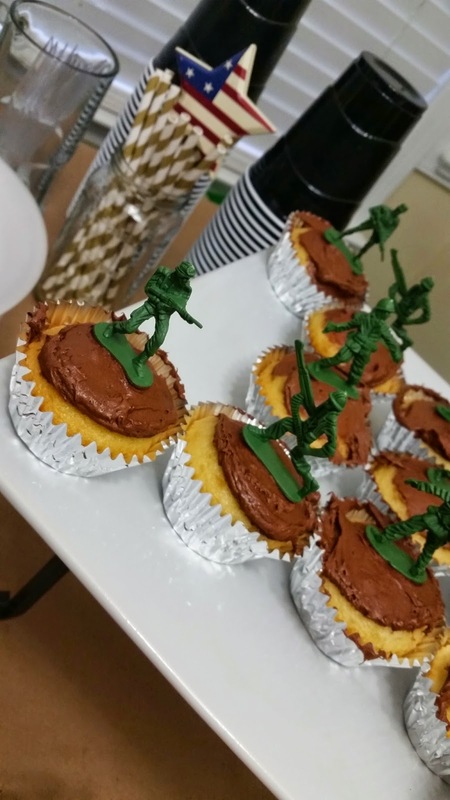 Have you thrown any fun Army themed parties? 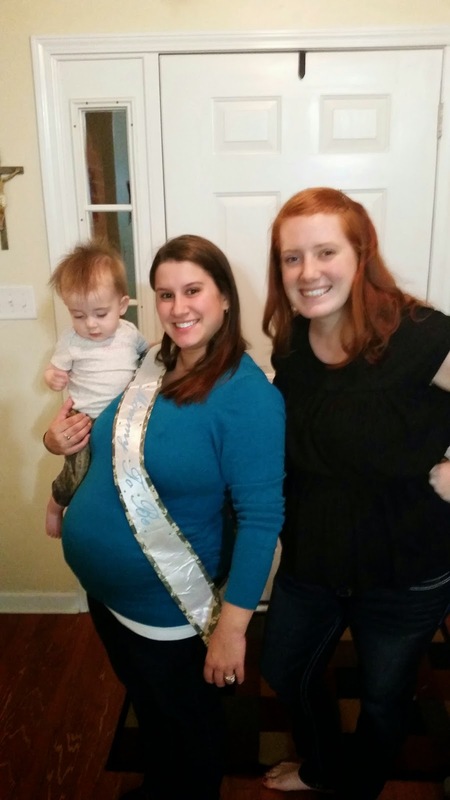 What about a fun themed baby shower? You did awesome, such a cute theme. Nice one! My sister’s baby shower was of the same theme. Her sister-in-law planned it all and it was in a nearby venue NYC. I baked the cake and cupcakes for the day and everybody loved it. It was nice coming across this post. 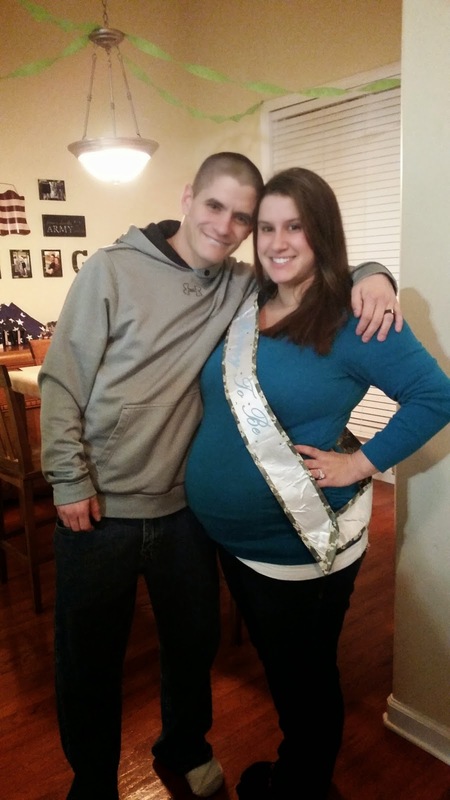 Congratulations to the mom-to-be.